TORONTO, ON – September 27, 2018 – It’s agile enough to take on downtown congestion, its low emissions mean everybody breathes a little easier, and it comes with a big bundle of standard technologies. There’s lots to love about the 2019 Toyota Prius c – the stylish and versatile hybrid that’s perfect for life in the city. New for 2019, the Prius c features an even more powerful Toyota Safety Sense C technology package plus a third model choice, making it easier to find the perfect Prius c.
“Canadian drivers love the nimble performance and impressive versatility of small hatchbacks – and they love the incredible fuel efficiency of Toyota hybrids. With the Toyota Prius c, they get it all – in a stylish and fun-to-drive subcompact that’s loaded with advanced yet easy-to-use technologies that put this vehicle in a class by itself,” said Cyril Dimitris, Vice President, Toyota Canada Inc. Performance and efficiency take centre stage in the Prius c. Under the hood, Prius c’s Toyota Hybrid Synergy Drive features a 1.5L Atkinson Cycle four-cylinder with Exhaust Heat Recovery System, plus a high-torque electric motor, powerful storage battery and sophisticated power management system. This works together with a continuously variable transmission to produce 99 net system horsepower and smooth, confident acceleration – ideal for the urban landscape. Even more impressive, Prius c sips fuel – at just 5.1 L / 100 km city/highway combined. In the city, this hybrid hatch is rated at a remarkable 4.9 L / 100 km. And all parts of the hybrid system are covered by an eight-year, 160,000 km warranty. The Prius c is meant to be admired and projects a modern image consistent with urban living. More than just a handsome hatch, the Prius c’s body is carefully styled to maximize its aerodynamic performance – achieving a drag coefficient of just 0.28 to slip through the atmosphere for better fuel efficiency and a quieter ride. 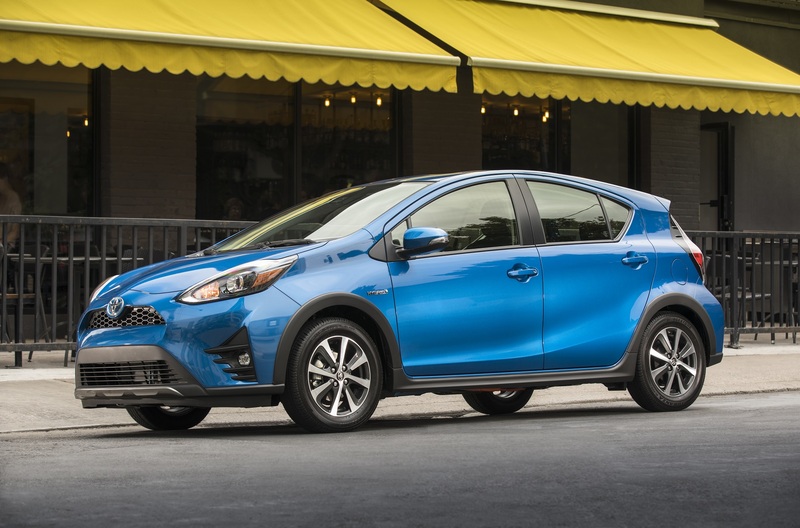 The Prius c’s wide stance contributes to nimble, athletic lane changes and cornering. And curbside, the Prius c invites admiration with its pronounced front grille, LED headlights, brake lamp and rear combination lamps, power adjustable and heated mirrors, front lower bumper spoiler and rear spoiler, and colour-keyed door handles. The Prius c’s interior is modern and surprisingly spacious, with room for up to 484L (17.1 cubic feet) of cargo when the 60/40 split folding second row seat is stowed. Cabin features include adjustable front seats, power windows with driver’s side auto up/down function, power door locks with keyless entry, a 12v DC power outlet for personal electronics, a digital clock, dual vanity mirrors, tilting and telescoping steering wheel, and plenty of thoughtful in-cabin storage boxes and pockets. Every Prius c features plenty of technology, too – including a touchscreen 6.1” Display Audio system with advanced voice recognition, USB audio input, Bluetooth® connectivity for personal electronics and steering wheel-mounted controls, cruise control, a 4.2” multi-information display, air conditioning with automatic temperature control, and outside temperature gauge. Modern technology also defines Prius c’s safety package, starting with Toyota Safety Sense C. This comprehensive array of active safety systems includes the Pre-Collision System, Lane Departure Alert, and Automatic High Beams and is designed to extend driver abilities to help avoid accident situations. New for 2019, the TSS C package on the Prius c has been upgraded with the addition of Pedestrian Detection to the Pre-Collision System. Other safety technologies include the Toyota Star Safety System, a suite of nine airbags, child seat anchors and rear door locks, and a back-up camera. And because a Prius c driving in electric-only mode can be whisper quiet, a Vehicle Approach Notice system warns pedestrians and cyclists of its presence. The 2019 Toyota Prius c (Starting MSRP: $22,260) is offered with Toyota’s Upgrade Package as standard equipment. This model features a four-speaker audio system, premium fabric seats and 15” styled steel wheels. The 2019 Toyota Prius c with Technology and Moonroof Package (Starting MSRP: $27,090) takes the hybrid hatch to the max, with enhanced technologies including a six-speaker audio system adding integrated Sirius XM satellite radio, navigation, phonebook and streaming audio via Bluetooth® and other features, plus Toyota’s Touch Tracer steering wheel-mounted controls and the Toyota Smart Key System with Push Button Start. Style and comfort get an upgrade too, with Softex-clad seats and synthetic leather instrument panel, heated front seats, 15” alloy wheels, black side rocker and wheel arch moldings, front and rear lower silver-accented body guards, LED fog lamps and (naturally) a power moonroof. The 2019 Toyota Prius c with Technology Package (Starting MSRP: $26,170) is an all-new offering for the 2019 model year. It features all the great features of the Technology with Moonroof Package, minus the moonroof – at a lower price. The 2019 Toyota Prius c is on sale at Toyota Dealers across Canada. For complete and up to date details and specifications, visit www.toyota.ca/priusc.